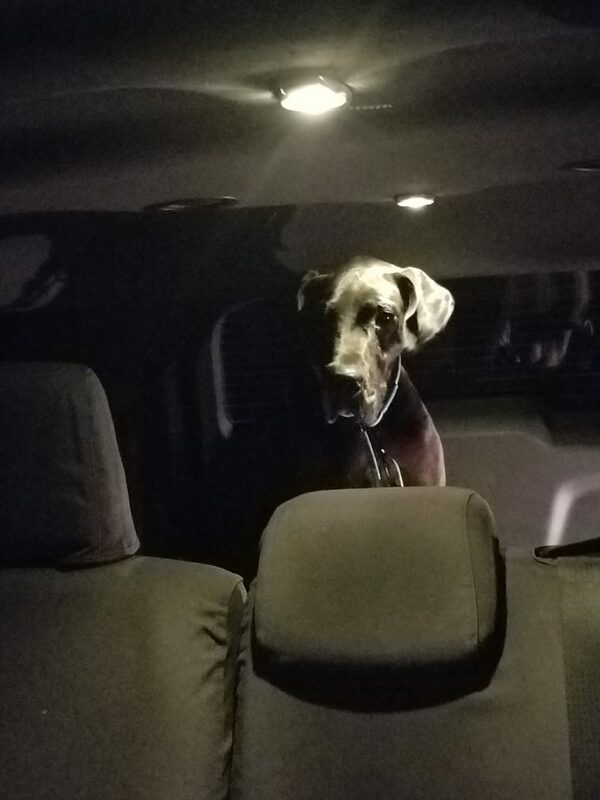 In June 2018, UMGDR was made aware of a stray Great Dane in Sandstone, MN. Formerly known as "Angel," Louisa had lived in a home but at some point took a severe aversion to men. Her former owner reported that one day, Louisa ran out of the house, and she could never get Louisa to come back into the house. Eventually, Louisa was left to live outdoors with limited shelter, reliable food, and no medical care. At the time that UMGDR was made aware of Louisa, she had lived outside as a stray for 3 years. It quickly became clear that this girl was brave, and her name was changed to Louisa, which means "valiant fighter." UMGDR notified The Retrievers, a group of volunteers which helps to locate, capture, and return lost dogs, to determine if they could be of help in bringing in Louisa. They set up a humane trap and a trail camera and put food inside the trap to lure Louisa in. A trail camera was also installed to catch glimpses of Louisa. A smart girl, she knew she did not want to go into the trap to eat the food, but she continually visited the site. The Retrievers, along with help from a volunteering neighbor, then moved the food bowl to just outside the entrance of the trap and kept it full of healthy and delicious food like chicken. Louisa began eating the food on a regular basis and coming by the trap site frequently. Volunteers painstakingly moved the food bowl closer to the trap, inch by inch, in the hope that Louisa would eventually be comfortable enough to go inside. In the end, though, Louisa was not captured by the trap at all but rather came willingly into UMGDR's care. In July 2018, a Retrievers volunteer was checking on the food and decided to check the barn on the property, where she found Louisa laying down in the corner. So as not to spook Louisa, the volunteer cautiously gave her time to get used to her presence, then after a couple of hours was able to sit next to Louisa, pet her and talk to her, and eventually even put a slip lead around her neck. Another Retrievers volunteer along with Amber Bement, a UMGDR volunteer and sitting president of the board, arrived at the barn a little later to help get Louisa into a vehicle, since she did not want to stand up. Louisa let all three volunteers pet her and allowed a collar and second lead to be put on her. Amber got a blanket out of her car with the thought of looping it under Louisa and lifting her up to stand. But Louisa got one whiff of the blanket and was immediately intrigued by the smell of Amber's dogs, showing the first sign of emotion that the volunteers saw in her. After some coaxing, Louisa stood on her own. She calmly walked a few steps than looked back at Amber, almost as if to say, "Am I doing the right thing?" When Amber opened her truck door, Louisa immediately hopped in like she had been doing that every day for the last 3 years. Once back at Amber's home, she then quietly and calmly came out of the truck and began her journey to a much better life. Louisa resting in the barn. In Amber's home, Louisa made enormous strides toward embracing the good life. She learned to nudge people's hands for pets and ear scratches, and when off-leash in Amber's fenced-in yard, she stuck close to her human. Louisa interacted well with Amber's Golden Retriever Walter, and the two even played, Louisa learning from Walter the proper etiquette for playing with other dogs and how much fun it can be. After a few weeks in Amber's home, Louisa was moved to a permanent foster home where she continued to come out of her shell and was eventually adopted by a family of 3 humans and two fur siblings. Louisa's 1st morning in Amber's home, having been caught the night before, preferring the concrete floor over the bed. Louisa's 2nd night in Amber's home, now warmed up to the bed. 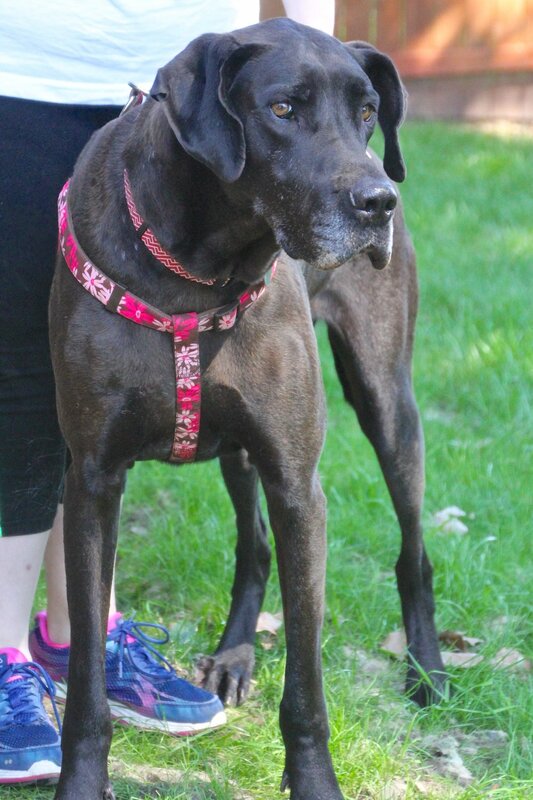 We are thankful to have found Louisa at a healthy weight (107.7 lbs) after being a stray dog for so long. At her vet check-up, she tested positive for anaplasmosis, a tick-borne disease that is treatable. X-rays were done on an abnormal toe on her back leg with the concern being that it might be a tumor, but thankfully, that does not appear to be the case. The vet heard a moderate heart murmur, and x-rays were done and showed that her heart is not enlarged or oddly shaped. In overall good health, she surprised her foster parents daily with her willingness to learn about and adapt to her new environment inside a house, and before long, Louisa was a permanent member of the family. She continues to adjust to her new world and is happy in her forever home.